A passion for politics and for political power is at the core of this biography of "Big Jim" Folsom, the legendary two-term Alabama governor who revolutionized state government by going directly to the "branchheads," the grassroots, to exhort the powerless to fight for their rights against the "Big Mules," the elite cotton planters and urban industrialists. Drawing on hundreds of hours of interviews with Folsom, his family and friends, and his allies and rivals, Carl Grafton and Anne Permaloff reveal in Big Mules and Branchheads the complex reality behind the stories and myths that have arisen around the Alabama governor. Often dismissed as a na ve yet somehow appealing yokel whose rise to power was largely attributable to luck, Folsom is seen here as a highly knowledgeable and creative political strategist who calculated his most important victories even while his behavior often seemed influenced by innocence and a tendency toward buffoonery. His two terms as governor were marked by scandal, yet Folsom energetically sought to raise the moral level of Alabama politics by bluntly advocating, in the face of great opposition, the expansion of civil rights for blacks, poor whites, and women. Folsom, the authors suggest, is as widely misunderstood in Alabama as Alabama is misunderstood throughout the nation. 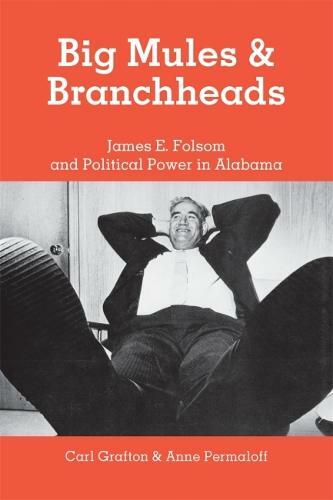 Illuminating the intricacies of Alabama's politics as it traces Folsom's rise to power, this book gives readers the unique opportunity to know the legendary Folsom as a flawed, yet often inspiring human being who energetically practiced his own colorful brand of politics. There is much about this book that is praiseworthy, particularly Grafton and Permaloff's prodigious research effort and their concerned quest for objectivity. Grafton and Permaloff will give us much more than just a book about Folsom. They probe beneath the surface of political conflict, uncovering forces at work behind the scenes. Anyone with time to read only one book on Folsom (that is, almost everybody) ought to turn to Big Mules and Brachheads. Grafton and Permaloff have mastered the political biography with all of its potential pitfalls, and added a new dimension. The authors have used the political career of one man to peel back, layer by layer, the politics of an entire state. [Grafton and Permaloff's] book explores nearly every facet of Folsom's personality and uses statistics of federal and state funding to examine his claims of improving roads and education in the state. Grafton and Permaloff are unafraid to draw conclusions. Their book is also more detailed, both about Folsom and his times.